Earlier this week I shared a new endeavour I’ve undertaken to get a better handle on my wardrobe. For the next 3 months, this is the wardrobe I’m working with: It doesn’t actually look that minimal to me, although to be fair I have bent some of the rules. 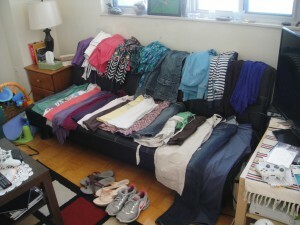 Although there are in fact 33 items pictured above, I decided not to count my shoes after all – I did a decent job of decluttering my shoes a while ago, and wearing only those three pairs (one pair of runners, one pair of casual sandals, one pair of dressier sandals) will just wear out those shoes and my feet. This is not a project in pointless suffering! So since I am just getting started, I’m not going to count shoes. Having un-counted those three pairs, I added in another top, and I’ve been wearing a jacket that is not pictures as well. True Project 333-ers include jewellery in their count, but I am not. Down the road, if I repeat this challenge, I might be a little stricter with myself, especially if the next two and a half months go as well as the last two weeks have. So far, I am enjoying that my closet isn’t packed, that the clothes I’m choosing from all fit and are seasonally appropriate. I tried to choose clothes that mix and match fairly well, and so far it seems that was a success. Limiting myself to one pair of jeans may have been a bit ambitious, especially since the weather cooled down for a few days, but it has worked out thus far. I might swap one of my dresses out for a second pair of jeans before I head home to Victoria just to be on the safe side. For those of you who could care less about my clothes – if you’re still reading thank you for bearing with me I will try to move on to broader topics soon! I’m always surprised what a nerve this topic touches off though, probably because clothes are so personal. In our culture it is so easy to accumulate stuff and quickly own more than we need or even use, and it’s just as true with clothes as anything else. Whether our wardrobes are the result of retail therapy, great sales, love of fashion, or the generosity of others, it is a very personal topic that we can easily become wrapped up in and take a great deal of our identity from. I’d love to have a conversation in the comments – is thinking this much about clothes completely self-absorbed? Or potentially useful, maybe? How big is your own wardrobe?